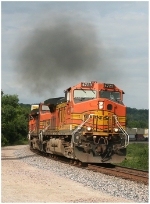 Description: BNSF Eastbound Freight Train rumbles through Wallis, Tx. 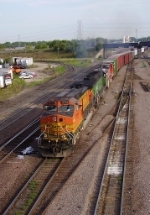 Description: A BNSF Trackage Rights Train came past led by a Santa Fe and 3 other BNSF Dash-9's. Description: This engine sort of surprised me so it's not the best shot, but you can see the MSTS Logo on the nose. Description: BNSF #4723 leads a baretable train eastbound at Summit in Cajon Pass. Description: The Microsoft Train Simulator unit makes a rare appearance on the point of NS #245 north of Warner Robins, GA. Description: Sporting its special logo, 4723 heads westward early in the morning. Description: The Train Simulator C44-9W notches up with 2 other units while leaving Northtown. Description: BNSF Dash 9 4723, the engine used in Microsoft Train Simulator, leads a westbound Z train through Westmont. Description: Hey look, thats the MSTS unit in the lead! Description: I knew the 4723 was coming, so I decided to bring along my CD case and I slid it into the crack between the door and the window in my car. Description: Z-STPCHC with a friendly wave and the Microsoft Train Sim locomotive leading rolls into GRAF and double track. Description: Sitting in the holding point at MP 23.4. Description: The Microsoft Train Sim loco departs Northtown. Trailing unit is CSXT 7682. Description: A northbound BNSF manifest waits in the siding at Buckholts. Description: 4723 stenciled with "Microsoft Train Simulator -Featured Locomotive-"